Headed back to School? Going back to work after a nice summer holiday? or about to flee the nest for your first year at Uni? Taking notes has never been easier in meetings or lectures. The Livescribe Echo Smartpen records everything you hear, say and write, while linking your audio recordings to your notes. Get quick access to important audio by simply tapping on your handwritten notes either on Livescribe paper, on a computer or a mobile device. 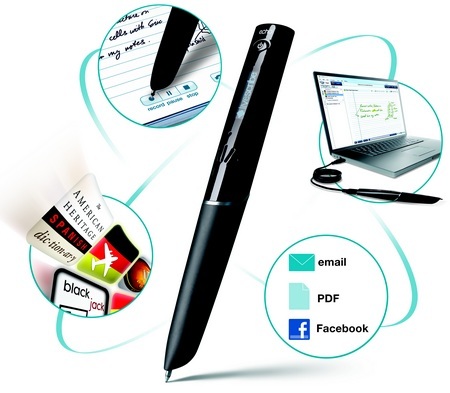 The Smartpen records everything you write and hear so you’ll never miss a word. Livescribe Desktop saves your notes and recordings to your computer for fast, easy access to what’s important. Search for words within your notes and find what you need fast. You can send all your notes and audio to your email, Google Docs, Facebook or your mobile phone, all from your pad of paper. The Livescribe Echo comes with 4GB of memory, enough to hold over 400 hours of audio, 64,000 pages of notes, or hundreds of applications. The pen works by interacting with Livescribe ‘dot paper’, regular paper printed with a unique pattern of tiny microdots. This tiny pattern works a lot like a GPS system for your smartpen, allowing it to capture everything it writes or draws on dot paper. The Echo smartpen only work with Livescribe Dot Paper, not conventional paper, and you can buy notebooks and pads from them in various sizes. But if that all sounds like it might be a bit expensive, you can also print your own dot paper for free on colour laser printers. The ION Docuscan is designed to make scanning easier, without the need for a computer or tricky software. When you need something scanned you don’t want to wait for a computer to start up, hunt for a cable and then have to figure out how to work the software. Docuscan gives you a one-touch, stand-alone solution for converting all your photos and documents to digital files directly to an SD card. The SD card support and sleek, portable design gives you the flexibility to scan remotely without the need of a computer. Or simply connect to your computer with the included USB cable and drag and drop the images. You can monitor your scanned images and documents immediately after being scanned with DOCUSCAN’s integrated 2.4″ LCD screen with zoom and rotate functions. Share your photos easily by ejecting the SD card and inserting it into any compatible reader such as a digital photo frame, mobile phone or computer. The Docuscan’s compact design makes it very flexible, and perfect for a cramped work space or Uni room. It is even compatible with the iPad and iPad 2 so you can transfer your photos straight to your tablet. It has an adjustable paper feeder so you can scan anything from 3×5 photos to A4 letters, and the scanner’s high resolution 300 DPI scanning ability means you won’t lose any quality during the conversion process. The Unisak is a one stop shop for all your university needs. It includes over 80 essential items for your bedroom, bathroom, kitchen and study, so you won’t need to worry about forgetting a potato peeler or alarm clock. It even includes a duvet and pillow, and branded toiletries for the more discerning student. You can have it delivered straight to your halls of residence, so you don’t need to lug it up from home. The manufacturers claim that at £149.99, it is 20% cheaper than the leading supermarket, and of course saves you hours of trawling through Ikea. Teasmade is a range of automatic tea-making machines. Produced since the 1930s, they’ve fallen out of fashion in recent years but are now ready for a come back. The all-new and revamped Teasmade is a thoroughly modern machine. With an alarm clock, AM/FM radio, reading light and input for MP3 players, it is a useful device for a student bedroom. Its wow factor, though, comes from the 600ml integrated teapot. The Teasmade is cleverly designed to boil the water before your alarm goes off, so by the time you wake up, your cuppa will be ready to drink. This iPhone 4 case is the perfect accessory for students. The rubberized hard shell features an integrated stainless steel bottle opener and will even pry open ring pulls. Best of all, the sturdy case comes with a free app that counts the brews you pop, displays pictures (from your library) and plays your songs/sounds of choice every time it cracks open a bottle. The Black Blum Lunch Pot is designed for stylish office workers, who want their lunch to always look its best. The sleek set comprises two pots with an ingenious watertight locking seal. It allows you to separate your yoghurt and granola, or noodles and fruit salad and is the perfect vessel for carrying your breakfast or lunch to work. The pot includes a spork and carry strap, and when empty the smaller pot will fit into the larger one for compact carrying. It is microwave and dishwasher safe. These may not be the prettiest lunch boxes we have to demo but they may well be the most useful. These silicone boxes are collapsible – once you’ve eaten your lunch, simply squash the cleverly designed box down to half its original size. Perfect for sliding back into your workbag and freeing up much-needed cupboard space at home. Each box is dishwasher safe and also comes with a plastic spork. Available in two sizes. This glossy portable plastic bottle features a supersized LEGO minifigure head as the bottle top. Smiling from his vantage point atop your bottle, this handy character holds 400ml of liquid and is perfect for packed-lunches or brightening up picnics. And it’s dishwasher safe too! Isn’t it annoying when you need to make a note of something at work and can’t find a pen or paper to write it on? If you’ve ever had this problem, Scratch N’ Scroll could be the answer. Scratch N’ Scroll is a mouse mat that you can make notes on. Write on it using your finger, the included stylus, or any pointed object. Once you have finished with your note, you can erase it by lifting up the semi-transparent paper cover. The mouse mat is compatible with optical and ball mice, and comes with a non-slip base. Jazz up your computer with this retro mouse. The Pixelated Hand Mouse works like a normal mouse, with left and right buttons and a scroll-wheel, but looks just like a giant windows icon. What’s not to like? 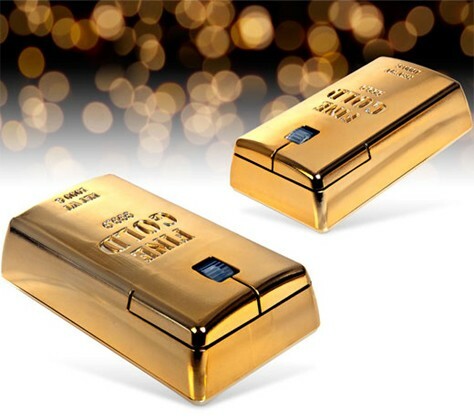 Add some bling to your internet browsing with this Gold Bullion Mouse. It may not actually be made of solid gold, but it does have a scroll-wheel, two buttons and is wireless. PC and Mac compatible. This USB mug warmer will prevent your cuppa from ever going cold. Perfect for through-the-night essay crises or long days in an overly air-conditioned office, the USB mug warmer will keep your drink at a cosy 50-80C. Just remember not to use a plastic mug and don’t touch the base. Is it a catapult, is it a pencil? No, it’s catapencil! The perfect office toy as well as great mischief-making for the kids (aged 8 and up), the Catapencil is just what you need on your desk to make the day more interesting. Load it up, fire off a balled-up receipt and then carry on writing as if you’ve done nothing wrong.